• Throw out the first 2 full buckets of ice to ensure all impurities have been removed from the water line. • Only connect the water line to a drinkable water source. • If you have to repair or disassemble the water line, cut off 1/4 of the plastic tubing to ensure a snug, leak-free connection. 1. Shut off the main water supply. 2. Locate the nearest cold water drinking line with a shut off valve installed. 3. Connect the water line installation kit to the shut off valve. 4. Connect the household water line to the assembled compression fitting. 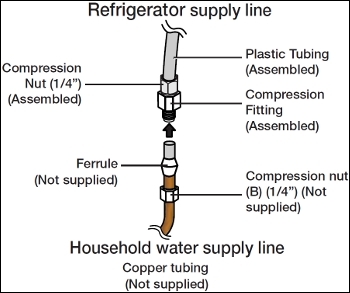 • If you are using copper tubing, slip the compression nut (B) (not supplied) and ferrule (not supplied) on the copper tubing (not supplied) as shown. 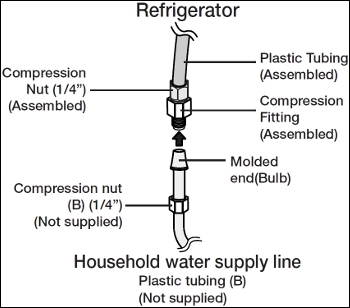 • If you are using plastic tubing (B) , insert the molded end (Bulb) of the plastic tubing (B) into the compression fitting. WARNING: Do not use plastic tubing (B) without a molded end (Bulb). 5. 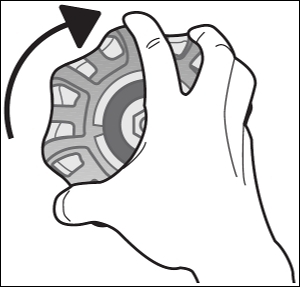 Tighten the compression nut (B) onto the compression fitting, without over-tightning the nut. 6. Turn water on and check for any leakage. If you find water drops or leakage in the connection areas, turn off the main water supply. Check the connections and, if necessary, tighten. 7. After installing the water line, flush the water line and filter by pressing and holding down the water dispenser lever with a container to catch dispensed water. Dispense at least 2-3 gallons of water to ensure that all air and impurities have been flushed from the system. 8. After flushing the lines, test the water pressure verify it is at a minimum water pressure of 20psi. Test the water pressure by dispensing water into a measuring cup for 10 seconds. • If at least 5.75 ounces of water is dispensed, the water pressure is above 20psi. • If 5.75 ounces of water is not dispensed. • If the refrigerator is installed in an area with low water pressure (below 20psi), you should install a booster pump to compensate for the low pressure. • Refrigerators without water dispensers do not have internal water dispensers. • When flushing the water lines for the first time, water will not dispense immediately because air is in them. • If you have been holding the dispenser lever for over 3 minutes and water is not being dispensed, verify that water supply valve is open and that power is being supplied to the unit.